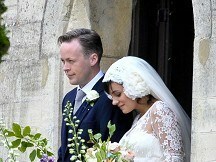 Pop star Lily Allen has got married in an intimate country wedding. The 26-year-old singer looked radiant as she arrived at St James the Great church in Cranham, near Stroud, Gloucestershire. Her father, actor and musician Keith Allen, escorted her into the church as she became Mrs Sam Cooper. Although the Smile singer wore a full veil with floral embellishments, she had it back off her face which meant her happy expression could be clearly seen by well-wishers. She clutched a bouquet of white roses and was cheered on by a crowd that had gathered outside the tiny church. The bride's dress, with long lace sleeves, a lace overlay, sweetheart neckline and a long train, had some echoes of the Duchess of Cambridge's wedding dress. It was created by French designer Dephine Manivet - despite rumours before the wedding that Lily would wear a Chanel dress. T4 presenter Miquita Oliver, a childhood friend of the star, was one of the bridesmaids. Fewer than 100 guests attended the service, including comedians Harry Enfield and Angus Deayton, who arrived together. There was a tight security presence as a large number of photographers captured arrivals. The couple paid for extra policing and two roads, five footpaths and three bridleways were closed.